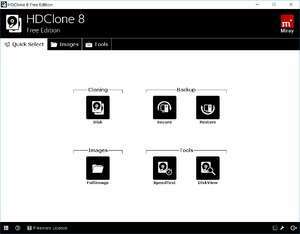 HDClone Free is a tool which clones an entire hard drive, makes backups and can also create ISO images of a volume. It is an efficient and useful program but lacks some of the features of the full version. Backing stuff up isn't always the most enjoyable task when it comes to computing but it can be a wise move, especially if you have precious data. With HDClone, you can simplify those tasks and create full backups. Version 8.0.7 is a freeware program which does not have restrictions and it's free so it doesn't cost anything. For security reasons, you should also check out the HDClone Free Edition download at LO4D.com which includes virus and malware tests. Additional screenshots of this application download may be available, too. 5 out of 5 based on 8 ratings. HDClone Free Edition has a presence on social networks.